STiR tea & coffee industry international 69 Emerson Leonard Sales Director What's the STiR in the next issue... STiR visits the highland coffee estates of southern India and discovers the the secret to the delicate flavor of Monsoon coffee... Katrina Munichiello describes the dynamics of Fairtrade... Ann-Marie Hardie takes us to Peru... Unilever discusses its plans for its T2 retail expansion... Dan Shryock delves into Dealing Direct and top soluble coffee manufacturers are finding new domestic outlets for a segment that has grown 40% since 2008. Jane Pettigrew Tea Correspondent Jane is a tea specialist, historian, writer and consultant who has authored several books on tea. Suzanne is a coffee and tea marketing consultant and has represented the industry as a speaker during trade show conferences. Jenny chases stories on agricul- ture, wellness, and business with a keen interest in sustainability. 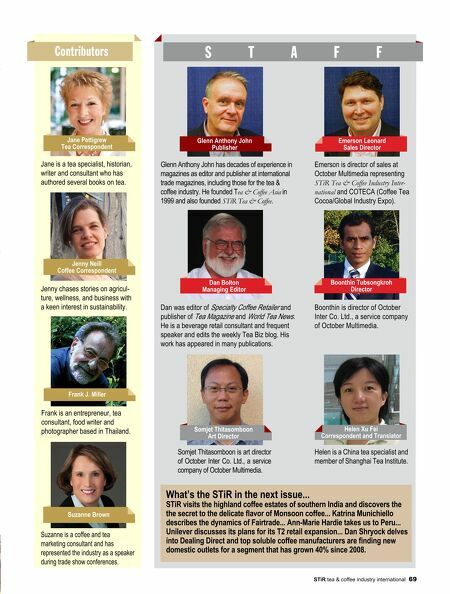 Contributors Jenny Neill Coffee Correspondent Suzanne Brown Emerson is director of sales at October Multimedia representing STiR Tea & Coffee Industry Inter- national and COTECA (Coffee Tea Cocoa/Global Industry Expo). Boonthin is director of October Inter Co. Ltd., a service company of October Multimedia. Helen is a China tea specialist and member of Shanghai Tea Institute. Glenn Anthony John has decades of experience in magazines as editor and publisher at international trade magazines, including those for the tea & coffee industry. He founded Tea & Coffee Asia in 1999 and also founded STiR Tea & Coffee. Dan was editor of Specialty Coffee Retailer and publisher of Tea Magazine and World Tea News. 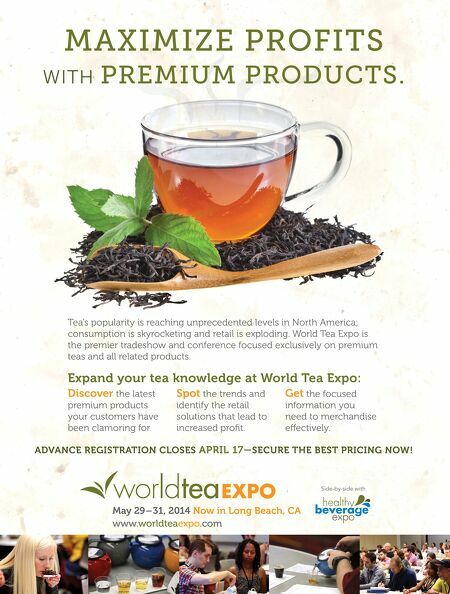 He is a beverage retail consultant and frequent speaker and edits the weekly Tea Biz blog. His work has appeared in many publications. Somjet Thitasomboon is art director of October Inter Co. Ltd., a service company of October Multimedia. S T A F F Boonthin Tubsongkroh Director Dan Bolton Managing Editor Glenn Anthony John Publisher Helen Xu Fei Correspondent and Translator Somjet Thitasomboon Art Director Frank J. Miller Frank is an entrepreneur, tea consultant, food writer and photographer based in Thailand.